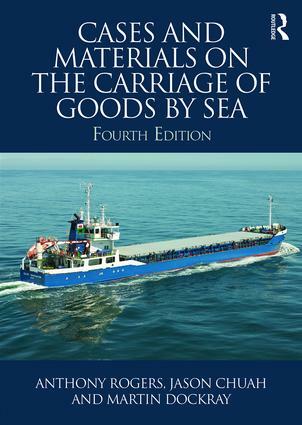 Cases and Materials on the Carriage of Goods by Sea, fourth edition, offers tailored coverage of the most commonly taught topics on Carriage of Goods by Sea courses. Combining a collection of legislative materials, commentaries, scholarly articles, standard forms and up-to-date English case law, it covers the major areas of chartering and bills of lading as well as matters such as exclusion and limitation of liability. This up-to-date collection of materials relating to the carriage of goods by sea will be of value to students of law, researchers and legal practitioners.